I don't know about you, but I am so glad September is over. September is the start of school, the start of routines, the start of new programs. To ensure a smooth start for the students everything has a sense of urgency. I have spent the last month developing workshops, creating accounts, fixing accounts, creating schedules, revising schedules, cataloging new library books, planning library lessons, preparing for clubs, arranging one-on-one sessions with teachers, reviewing curricula and standards, developing tutorials and support pages for the staff intranet, preparing school sites and classroom pages, visiting classrooms, updating library links and resources, making sure technology is available and working, and so many other little things to help teachers teach and kids learn. Outside of school I am taking a course on multi-media design through Rutgers. I also volunteered to support my state organization; I now chair the Website Committee of the New Jersey Association of School Librarians. I don't do all of this on my own; I support and am supported by a fantastic network of professionals. 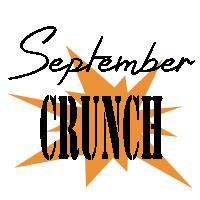 We have all felt the September Crunch in our own way. All of this is a lame attempt to explain why the blog has only had one post in September. Now that schedules have settled and routines are in motion I look forward to sharing great resources, tools, books, and media through this platform.